For the 24 hours to 23:00 GMT, the EUR declined 0.20% against the USD and closed at 1.1375. The European Central Bank (ECB), in its October monetary policy meeting, decided to keep its benchmark interest rate steady at 0.00%, for a third consecutive policy session. Further, the bank reiterated that its QE programme would cease in December. Additionally, officials signalled that the key interest rates will remain at their present levels at least through the summer of 2019. In a statement following the ECB meeting, President, Mario Draghi stated that that policymakers were confident about the economy’s strength and that the inflation is gradually approaching its goal of “below, but close to 2%”. On the data front, Germany’s IFO business climate index dropped more-than-estimated to a level of 102.8 in October, compared to market expectations for a fall to a level of 103.2. In the previous month, the index had registered a level of 103.7. Moreover, the nation’s IFO business expectations index slid to a level of 99.8 in October, following a reading of 101.0 in the prior month. Market participants had envisaged for the index to drop to a level of 100.4. Additionally, IFO current assessment index eased to a level of 105.9 in October, compared to a reading of 106.4 in the preceding month. Market participants had anticipated the index to decline to a level of 106.0. In the US, data showed that the US preliminary durable goods orders unexpectedly climbed 0.8% on a monthly basis in September, defying market expectations for a drop of 1.5%. In the prior month, durable goods orders had recorded a revised gain of 4.6%. Meanwhile, the nation’s pending home sales surprisingly advanced 0.5% on a monthly basis in September, compared to a revised fall of 1.9% in the previous month. Market participants had anticipated pending home sales to record an unchanged reading. However, advance goods trade deficit unexpectedly widened to a level of $76.0 billion in September, compared to a deficit of $75.8 billion in the prior month. Market participants had envisaged the nation to post a deficit of $75.1 billion. Further, seasonally adjusted initial jobless claims jumped to a level of 215.0K in the week ended 20 October 2018, in line with market expectations. Initial jobless claims had registered a reading of 210.0K in the previous week. In the Asian session, at GMT0300, the pair is trading at 1.1371, with the EUR trading a tad lower against the USD from yesterday’s close. 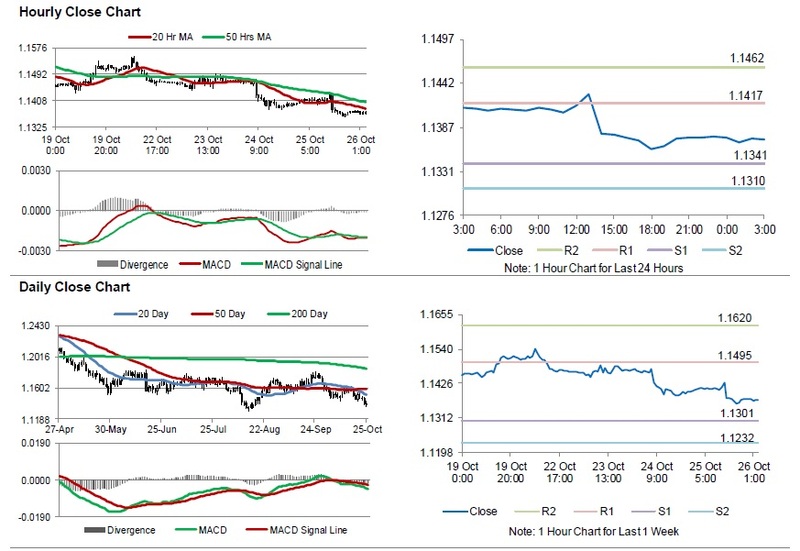 The pair is expected to find support at 1.1341, and a fall through could take it to the next support level of 1.1310. The pair is expected to find its first resistance at 1.1417, and a rise through could take it to the next resistance level of 1.1462. Going forward, investors would closely monitor the European Central Bank, President Mario Draghi’s speech, and Germany’s GFK consumer confidence index for November, due in a few hours. Later in the day, the US 3Q gross domestic product figures along with the Michigan consumer sentiment index for October, will keep traders on their toes.